Late last year, I met Mrs Pademelon and her Joey. 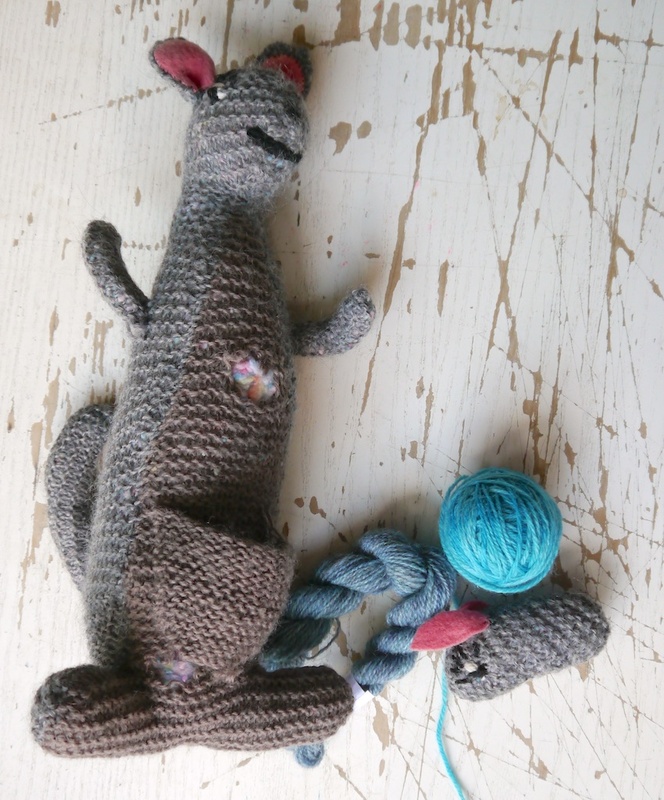 Mrs Pademelon and her Joey, in dire need of a spot of darning! 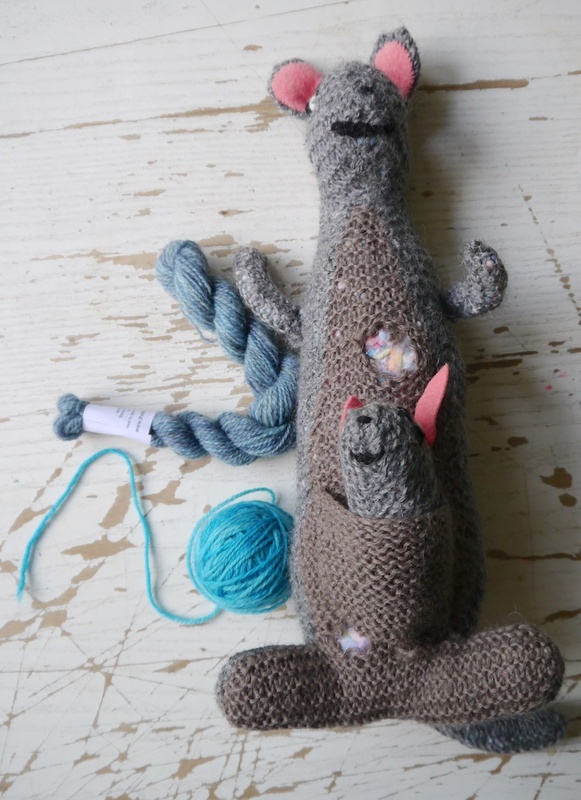 This toy was knitted for a colleague’s husband by his mum, based on his favourite book, Mrs Pademelon’s Joey. It was much loved, although a balaclava knitted from the same wool was deemed too scratchy by the young recipient. Subsequently, when my colleague’s daughter was born, Mrs Pademelon became her beloved companion, and still loves her now, ten years on. Mrs Pademelon has received the love of two young children along and has lived a while in the loft. Looking after children is hard work, as Mrs Pademelon can attest, and her coat is much in need of repair. Joey was misbehaving when I took this picture! When my colleague asked me to repair this cherished knitted toy, I was somewhat flummoxed by her name. It turns out that pademelons are small to medium sized marsupials found inhabiting the forests of Australia and a number of its surrounding islands. The pademelon is most closely related to the wallaby and the kangaroo. The pademelon is a solitary and nocturnal animal meaning that the pademelon, spends the light daytime hours resting, and goes foraging for food during the cooler cover of night. 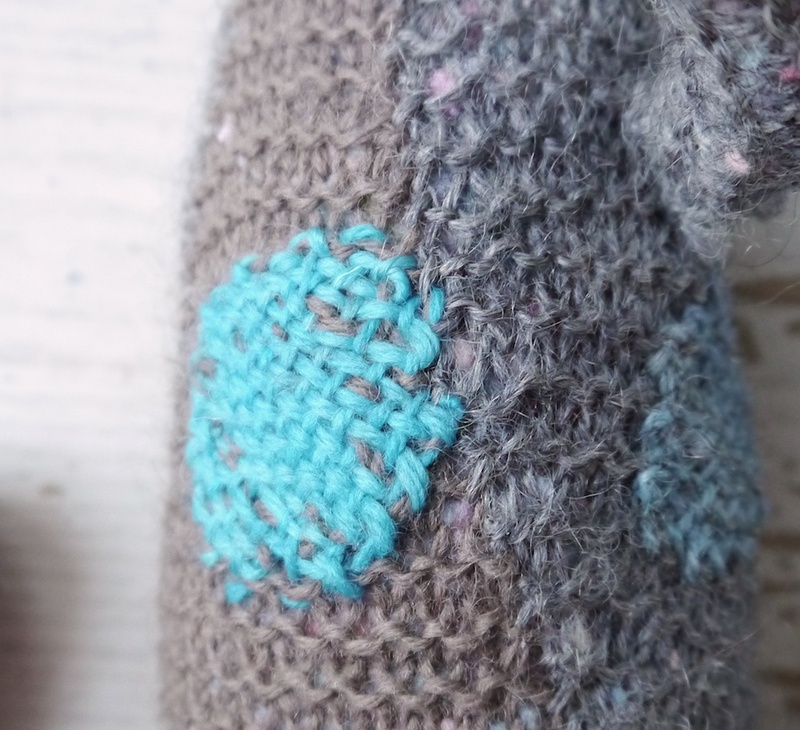 For the repairs I used two yarns from The Little Grey Sheep: the solid blue is Stein Fine wool, and the heathered blue is Hampshire 4-ply. 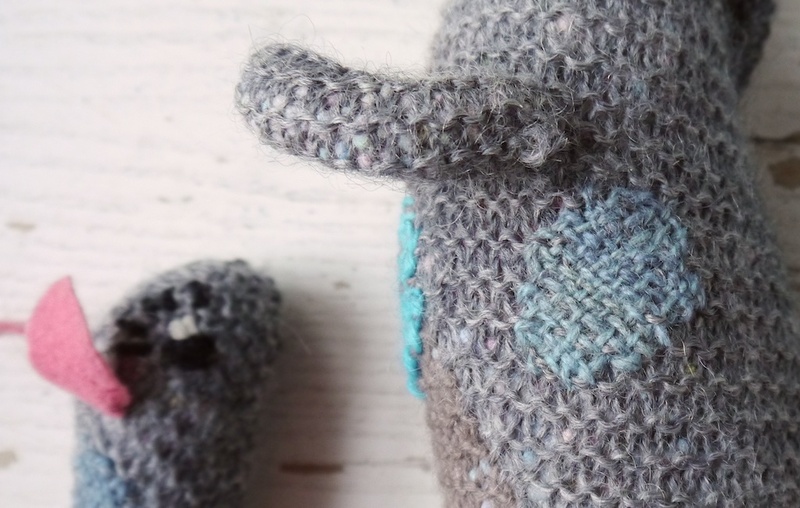 For such a classic knitted toy, I used the perenial classic stocking darn as a technique. I worked the darn on the bias, as I find that works nicer on the garter stitch background. The heathered blue makes for a vibrant repair. Repairing this toy brought simple pleasures: perhaps it was not the most challenging job I’ve ever done, but nevertheless it was immensely satisfying. 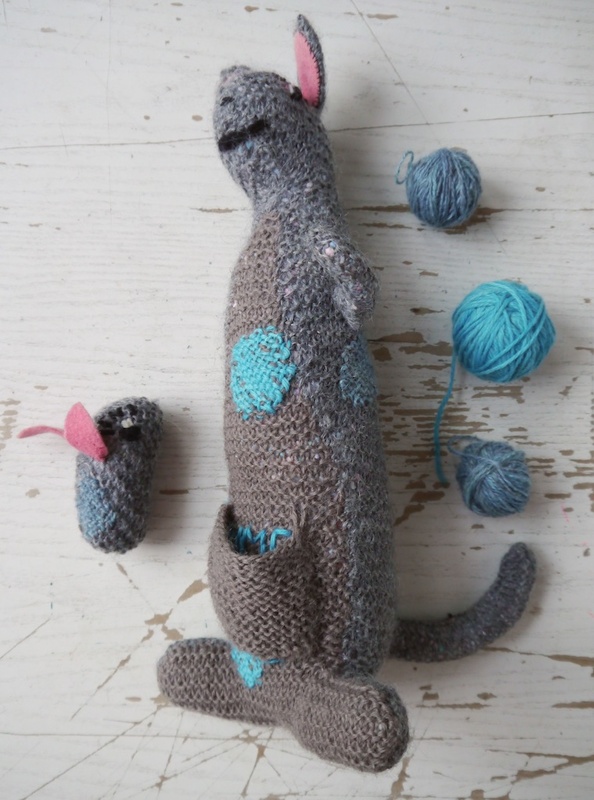 While stitching, I tried to imagine what it was like to knit this toy: I’m not sure there was a published pattern. 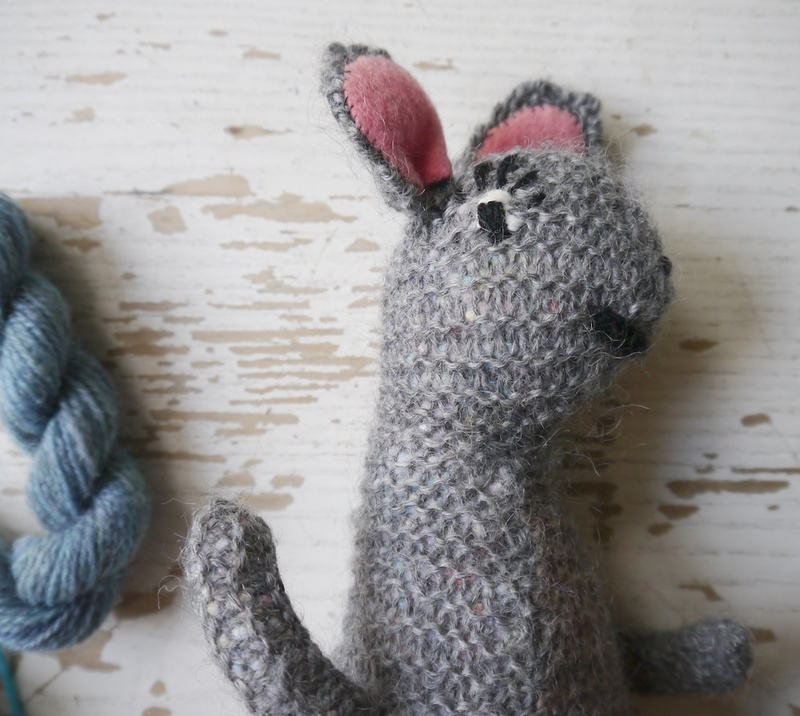 Every child enjoys a cuddly toy, and being able to make one for your own child imbues it with care and love for that child. It made me chuckle to think that the balaclava from the same wool wasn’t appreciated quite as much due to its scratchy nature! 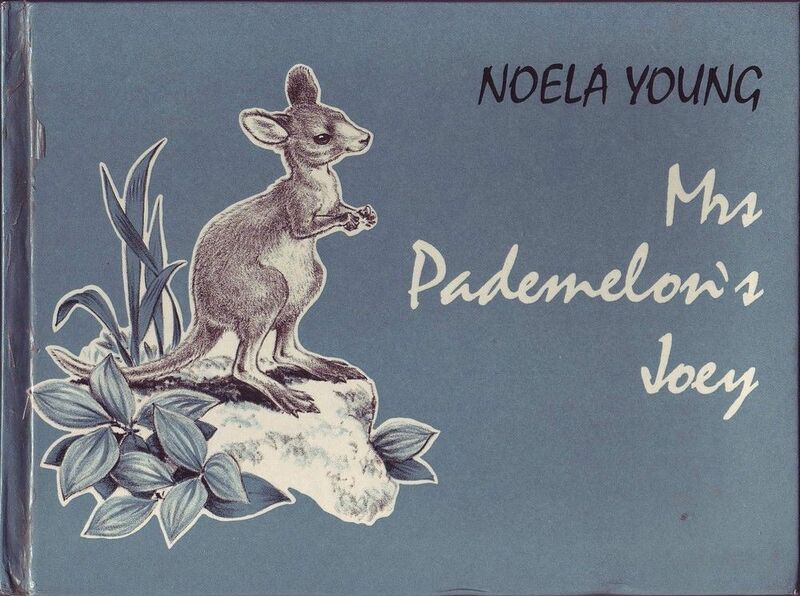 Clearly much loved, I hope that Mrs Pademelon and her Joey will stay in my colleague’s family for a long time to come and will bring joy to a few more generations of children.